Oxalic Acid is a powder base acid concentrate commonly used to remove rust, algae, dirt and grime stains from boat hulls and surfaces. Simply mix with water per directions. Great for removing brown waterline stains around the bootstripe. Oxalic acid also effectively cleans and brightens teak and mahogany wood surfaces prior to refinishing. Homeowners also use oxalic acid to remove tannin and iron stains from wood decks, particularly cedar and redwood types. Rinse repeatedly 3 times with clean water and allow to dry. If top coating with a water base finish, rinse with a solution of one tablespoon baking soda per one gallon of water. Keep galvanized trailers wet with fresh water during application and rinse thoroughly when finished. 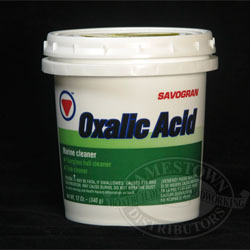 Oxalic acid can be applied with a scrub brush or with a pump up sprayer. Mix powder with water. Three tablespoons of cleaner makes one gallon of cleaning solution. The 12 ounce package will make four gallons of cleaning solution and cover approximately 1600 square feet of surface. Before use, read all information on container. Protect eyes with goggles and wear rubber gloves. Protect skin from splashes. Do not breathe spray mists. Do not mix with chlorine bleach or other chemicals. Can Savogran Oxalic marine Cleaner be used to clean sprinkler stains on painted masonry block walls? Rust stains on concrete seem to respond best to acids of various types. The classic treatment is oxalic acid, which is sold as a wood bleach. It is often sold in small bags. To use oxalic acid, mix one-half cup of the powder in a gallon of warm water and mop it on the stain. I have used it for this purpose successfully, but sparingly. Ive used it all over my boat but not on vinyl. Find a piece of old vinyl and try it. Works great on water stains on hull and fiberglass. Dont over do it and follow instructions. Hi Robert, thanks for your reply, what dilution rate did you use and how long did you leave it to soak? Regards John. Hi Larry thanks for the info, i'll give it a go.Regards John. Thanks Robert, I'll give it a go. Regards John. Has anyone used this product for faded/chalking on fiberglass? Not for chalking. I used oxalic acid to remove green algae/grime from docking my boat all summer - so I cleaned the bottom only. I have removed chalking with marine wax tho. I used macquires marine wax along with a cleaner wax (wax it 2x). Not aware of using this on fiberglass for chalking. Stain removal, yes. i never used this to clean caulk specifically, however, i used it on teak decking which has caulk between each board and on teak trim which has caulk between the fiberglass and wood. i did not really pay much attention to the cleaning of the caulk itself. so, if your main concern other than cleaning is the chance of it damaging your caulk, i did not notice any ill effects. if the caulk has mildew on it, it may clean it. sorry i could not be very specific. does oxalic acid kill grass ? I don't know but I have a feeling that it would in strong concentrations. Thanks Robert. My issue is when I use Oxalic acid on a walkway NEXT to the grass, will it kill the grass if it goes on it ?? Oxalic acid is a bleach. It is likely it will kill grass in a strong solution, but there are better products for that purpose. Yes it probably will, but I would clean the walk way and let the small amount of damaged grass grow back. Can I use oxalic acid to clean large number of small brass parts? If so how to do this? Works great to remove saltwater stains. Does not harm glass. reapply wax afterwards. place a couple of teaspoons in a gallon sprayer and let sit 3/4 minutes. rinse off. I have never used Oxalic acid to clean Brass, I have solely used it to remove the yellow scum line just above the boot top on my yacht and to remove Mildew and stains.However, if you dilute 1 cup of acid into a gallon bucket of hot water and ensure it dissolves, it should work by merely placing the brass in it. can i use this to clean teak garden furniture? Yes, If you have green scum, mildew. I think so. Some powdered teak cleaners are made with oxalic acid. Probably ok.